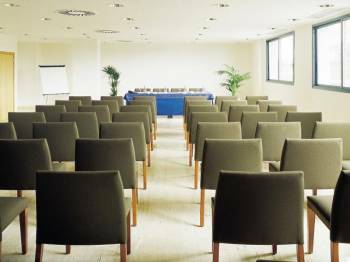 The Barberà Parc is the ideal place to host all kinds of conferences, conventions and other events. All classrooms are equipped with spacious tables and comfortable chairs as well as natural light and blackout curtains systems to ensure complete darkness in the projections.We can supply any type of audiovisual material previous request and budget. Overhead projector.Slides.Projection screen.Video and TV monitor.Computer Projector VGA 350 Lux.PA system.